Ghesmati, M., Taheri, H., Meratan, A., Pour Mohamadi, P. (2017). Cell Wall Extract from Piriformospora indica Enhances Valerenic Acid Content in Valerian Roots via Modulating Sesquiterepene Synthase Genes. Journal of Applied Biotechnology Reports, 4(3), 645-650. Mansour Ghesmati; Hengameh Taheri; Ali Akbar Meratan; Payam Pour Mohamadi. "Cell Wall Extract from Piriformospora indica Enhances Valerenic Acid Content in Valerian Roots via Modulating Sesquiterepene Synthase Genes". 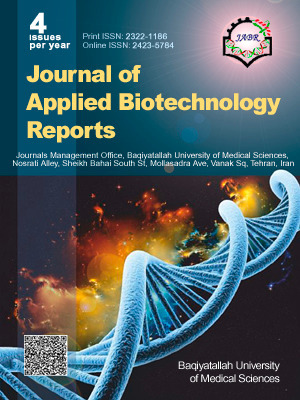 Journal of Applied Biotechnology Reports, 4, 3, 2017, 645-650. Ghesmati, M., Taheri, H., Meratan, A., Pour Mohamadi, P. (2017). 'Cell Wall Extract from Piriformospora indica Enhances Valerenic Acid Content in Valerian Roots via Modulating Sesquiterepene Synthase Genes', Journal of Applied Biotechnology Reports, 4(3), pp. 645-650. Ghesmati, M., Taheri, H., Meratan, A., Pour Mohamadi, P. Cell Wall Extract from Piriformospora indica Enhances Valerenic Acid Content in Valerian Roots via Modulating Sesquiterepene Synthase Genes. Journal of Applied Biotechnology Reports, 2017; 4(3): 645-650.